Now I’m back with the second part of my discussion with current Spirit CEO Bob Fornaro and his successor Ted Christie. In the first part, we focused on the network, but here we spoke about the operation. When I first talked to Bob last year about it, things were looking promising, but now with another year under the airline’s belt, I wanted to see if the the team was still feeling good about the sacrifices it made to improve the operation. [Spoiler alert: It is.] Read on to learn more. Ted Christie, President and CFO, Spirit Airlines: [Bob Fornaro, CEO of Spirit] and I sat down and said, “I think we if we run better we can do this.” It took some risk because our roots were about pushing the airline, utilization. To his credit, he encouraged us to take a little risk. And he’s right. Once it starts working it feeds itself. Bob Fornaro, CEO, Spirit Airlines: High load factors and unpredictable weather. It’s hard. Particularly the weather events are difficult to manage because you don’t know. Other than Newark which you know every day for 6 hours… but it’s hard to plan. If you plan on Chicago air traffic control issues every day, you may be late but you won’t disrupt your airline. Cranky: How do you quantify the benefit from operational improvement? Do you have a number? Ted: The easiest one to measure is what we call interrupted trip expense which is code for “we screwed up and have to buy someone a ticket on another airline.” It’s direct, you can see it, it’s quantifiable. That is multiples of tens of millions of dollars historically the company has spent putting people on other airlines. Cranky: In what time period? Ted: In the last 3 years, an annual average. Ted: And so that’s a basket of opportunity. When your completion factor is 30 bps or 50 bps better than it was before, that number will have a dramatic reduction immediately. But where you also see it is overtime at the airport. You see it in what we call “credit to block” for crews because they no longer have to extend their duty because they’re on time. You see it in freight; the amount of times parts are chasing airplanes throughout the system because they’re not in the right place at the right time. You see it in hotel bills, because you don’t have to displace a crew and deadhead them to the airplane as much. And so, the tendrils in the income statement are massive. FP&A, because I force them to, spends a lot of time saying “where is it?” but you see it all through. Cranky: So is this now, looking back on it, just easy to say this was the right decision? Ted: Without a doubt. The cost exercise is nice, but the proposition to the customer, to the guests onboard, is massive. What we figured out to do — Bob said it in his comments with Mike [Boyd, onstage at the conference] — we didn’t change the product. We’re still the same Spirit. We just did it better and people like us. That has tremendous value not only to the guests onboard the airplane but the people working. The esprit de corps is huge and it feeds on itself. That’s the part of the value proposition that’s most impressive. Bob: And you manage better. So, we were chasing disruption. Once you begin to gain stability then you can really run a business. It sometimes is really hard to pinpoint a cause of things. We didn’t really have a vision of what we wanted the airline to look like and how it should run. And now the effort that it takes to add 15 airplanes today versus where we were is very different. We’re much more organized. I think when you get it under control, you can spend less. It’s organized, you’re not chasing things anymore. It’s interesting to watch the activity around the office. I remember my first couple months in the office. We were on 10 or 11 o’clock calls working on disruption. Bob: And so our situation is, when things aren’t going right, we get on the phone. It’s a very big motivator. Cranky: Is [the operation] where you want it to be now? I know some airlines will throw a bunch of padding to temporarily improve and then try to back off of it. Are you running how you want it to run? Or do you have measures in just to fix that you can start peeling off? Bob: You have to get there before you can decide if you’re in the right place or not. Unless we have huge hurricane issues, we should finish the year at 80 [percent on time] or above. And then we ask, “is this the right place?” We need to evaluate all the metrics. First of all, we have put some block padding because you have to, but this is not pad like some of the other carriers. We also think if this foundation is good, then we may increase the utilization of our fleet. 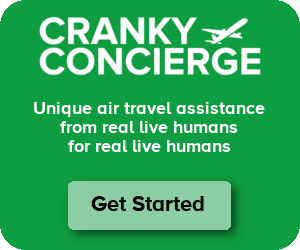 Cranky: Because it should run better. Bob: It should run better. So we’re kind of going through that, but we also kind of have the luxury because we like where the cost structure is. We don’t have to turn the knob all at once. But I think the plan will be to increase the utilization a bit going forward. If we can do that and maintain the quality that’ll reduce the costs even more. So that’s kind of the way we’re thinking about it. Thanks to Bob, Ted, and the Spirit comms team for setting this up. Never thought I would say this, but I’m giving Spirit a try 3 weeks from now, and it’s all because I feel comfortable with their focus on operational competency. I have a training class that starts at 8:30 am in LAS and my flight is scheduled to arrive from SAN at around 7:30 am. I like that I can choose to pay for the items that are important to me. I travel light and will just have a backpack, but shelled out $24 for a Big Front Seat which is worth it to me. Fingers crossed! If the training class is important, I wouldn’t cut it that close on *any* airline. If it was business travel, it would be a no brainer for me to arrive the evening before and stay at a hotel near the training event. Much less stressful for me personally. Good luck! Considering doing a podcast please for such interviews. Cranky did at one time, perro the lack of advertising $$$ probably contributed to the site going back to straight non-push streams. Either way, we still get top quality content! !